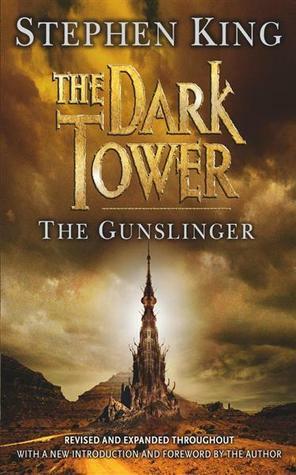 In The Gunslinger, Stephen King introduces readers to one of his most enigmatic heroes, Roland of Gilead, the Last Gunslinger. He is a haunting figure, a loner, on a spellbinding journey into good and evil, in a desolate world which frighteningly echoes our own. Roland Deschain is looking for the Man in Black. Roland meets a farmer called Brown, who has a creepy crow called Zoltan. He tells Brown about how he visited Tull while looking for the Man in Black, but he missed him by about a week. A barmaid in Tull called Alice told Roland that the Man in Black brought a guy called Nort back to life. Sylvia, a pastor, tells Roland that she is pregnant with the Man in Black’s child. Roland kills the baby. Sylvia turns the town against Roland, and Roland ends up killing them all. Having told this story, Roland leaves Brown to carry on searching for the Man in Black. Roland comes across a boy called Jake, who gives him water. Jake is from another world, but can’t remember where he came from. Roland hypnotises Jake and learns he is from New York. A man (presumably the Man in Black) pushed Jake into the street, and Jake was hit by a car and died. Roland comes across a demon in the cellar. He reaches into a hole and finds a jawbone. Jake and Roland leave the way station. One night Jake is almost taken by the Oracle. Roland uses the jawbone to lure the Oracle away, thus saving Jake. Roland couples with the Oracle as he wants to learn about his fate. Roland tells Jake about how he and his friend Cuthbert foiled a plot to poison a town called Taunton. Roland tells Jake that he was the youngest person ever to become a gunslinger and he defeated a guy called Cort. Roland and Jake reach the mountains, where they enter a mine. They’re attacked by Slow Mutants. The Man in Black shows up and says that if Roland saves the boy, he’ll never catch him. Jake falls and dies. The Man in Black tells Roland about his fate. There’s stuff about The Sailor, The Prisoner, The Lady of Shadows, and more. The Man in Black says he’s a pawn for the true enemy who controls the Dark Tower. The Man in Black tries to tell Roland that he’s insignificant in the grand scheme of the universe. Roland falls asleep, and when he wakes up he finds a skeleton next to him. He thinks this is the Man in Black. Roland goes to sit by the sea to think about his next step.